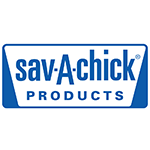 Designed for keepers of small flocks, each packet of Sav-A-Chick Probiotic Supplement conveniently mixes into 1 gallon of drinking water. The single-use packets are pre-measured to ensure accurate feeding, as well as product freshness. Formulated specifically for poultry, the balanced probiotic formula provides beneficial bacteria in the digestive tract to help the bird maintain a healthy digestive system.